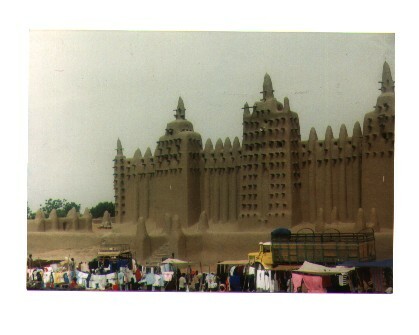 This is the great mosque in Djenne, Mali on market day. The annual rain washes away the outer layer of the mosque, and consequently, it must be re-skinned frequently. Mali is consistently ranked one of the five poorest countries in the world (the average person makes about $200 a year American). It's northern half is Saharan desert - endless rolling dunes. It's southern half is Sahel - flat, hard-packed sand with occasional scrub, much like the American Southwest. Splitting it in half is a big loop of the Niger River -- the lifeline of the country. "Bamako, the capital, is big and fairly modern, as are most of the African capital cities. It'll never let you forget it's third world at heart though. The streets just stop after a point, and continue out of the city in dirt trails. ..and most business is conducted on the streets and in the open air markets. " I took the train - a story for another time. Yet despite the desperate living conditions, they build these amazing structures, cities in the desert, and they have a thriving barter economy, as they have for centuries. 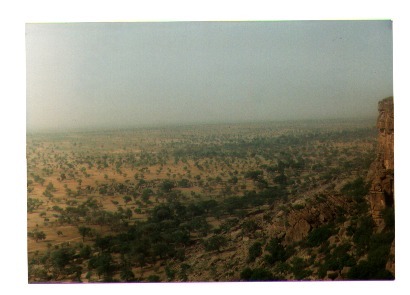 Mali is also the home of Timbuktu (yes, that Timbuktu), although in Mali it is properly know as Tombouctou.